It just might take a sideshow to draw wallet-wary fans to the track. The economic downturn is threatening to decimate high-cost motor sports. For example Formula One, the world’s most popular auto-racing circuit, is facing its biggest crisis in 40 years, according to Max Mosley, president of the sport’s governing body. He compares F1’s status to the global housing and credit bubbles. And since Honda, which had spent about $300 million annually on Formula One, decided to pull out of the sport altogether, F1 has blown a tire. Things aren’t as dire on the American stock-car circuit. But without question, NASCAR, which kicks off its racing season with its most prestigious race, the Daytona 500, on Feb. 15, has stalled. More than any other major pro sport, NASCAR depends on corporate sponsorships to fund its operations. Those logos splashed all over a driver’s racing suit aren’t just for show. The sponsorship has grown to the point where the more corporatized circuit has alienated a portion of the sport’s beer-drinking core. And as these companies pull back on their marketing budgets in the face of massive layoffs and losses  Sprint, NASCAR’s largest TV advertiser, will slash 8,000 jobs after losing $1.2 billion in the first three quarters of 2008  the financial foundation of the sport is at risk. In fact, four weaker-performing teams in the Sprint Cup Series merged to try to cut costs and stay competitive: Gillett Evernham Motorsports absorbed Petty Enterprises, and Dale Earnhardt Inc. joined up with Chip Ganassi Racing with Felix Sabates. “The problem you have with NASCAR is kind of like you have in professional baseball,” says Sabates. “You have three or four teams that have all the money and can buy all the talent and have all the sponsors.” As sponsor money dries up, weaker teams and drivers can perish. With high fuel prices deterring trips to the track last summer, NASCAR attendance dropped nearly 10% in 2008. This season, with the recession, ticket sales have lagged. 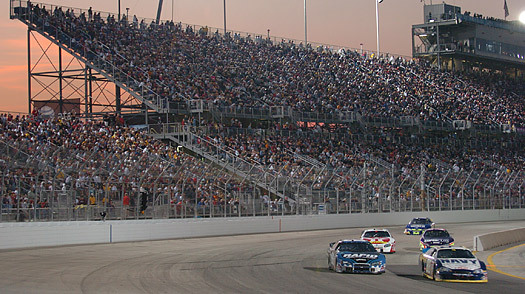 In early February 2008, Daytona seats were sold out. This season, plenty of seats were still available. International Speedway, which owns 12 Sprint Cup tracks, including the Daytona International Speedway, recently announced that advance sales for all its tracks were down 17%. Eddie Gossage, president of the Texas Motor Speedway, a Speedway Motorsports track that hosts two Sprint Cup races, laments that funding for corporate hospitality tents has dropped. “All of the executives are scared to death of being used by a grandstanding Congressman or newspaper columnists who say, ‘Look at the excess,’ ” he says.